Lauren Rebecca: Holiday Gift Guide: Stoic Designs. Holiday Gift Guide: Stoic Designs. One thing that I think is so important, is supporting small businesses. This holiday season, that is exactly what I'm doing. My Holiday Gift Guide sheds a light on small businesses. Today's feature is Stoic Designs. After a long week of being sick, we did a little Christmas decorating this past weekend and later on this week, you will get to see some of these fun signs from Stoic Designs in our home. Stoic Designs is giving away a free print of your choice!! Enter below for a chance to win a lovely print of your choice. Also, don't forget that you can use code: LAURENREBECCA15 for 15% off. Stoic Design was inspired by my love for quotes and literature, and my husbands graphic design talents. We started making a few pieces for our home, which led to a few for friends, a couple craft shows, and now it's grown to a full line of canvases and prints. After our second son was born, it was so hard for us to both work full time jobs, do Stoic Design on the side, AND spend time with our kids. So we started rapidly expanding our lines, which increased our sales, which has allowed me to run our Etsy shop full time. Every Christmas since our oldest son, who is five now, was born, we've loved spending Christmas Eve as a family. We bake cookies for Santa, read "How the Grinch Stole Christmas", and watch a Christmas themed movie...last year is was Home Alone (a true Christmas classic!). After the kids are tucked in, my husband and I get to sit together and admire our Christmas tree and talk about how lucky we are to have so much happiness in our lives. Best Seller in your shop currently? 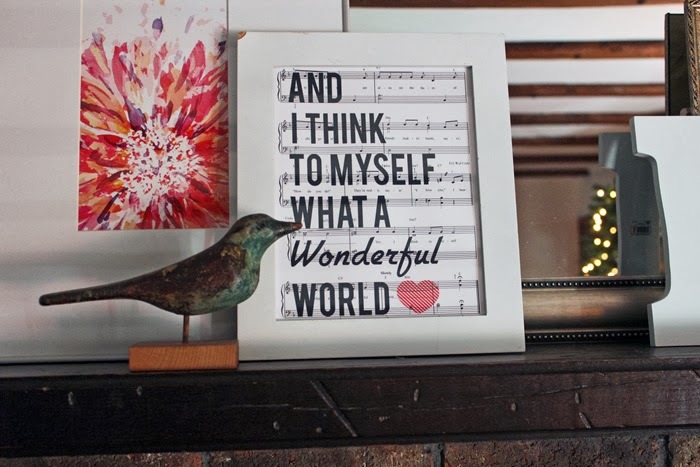 Our "And I Think to Myself, What a Wonderful World" canvas is consistently our number 1 seller. And perfect for the holiday season! Enter to Win A PRINT of your Choice. OMG I love the Three little birds Bob Marley print! All rights reserved. Please do not take content or images from this site without written permission. 2010. Watermark theme. Powered by Blogger.